Don’t waste the chance to get amazing discounts from Samsung TV. 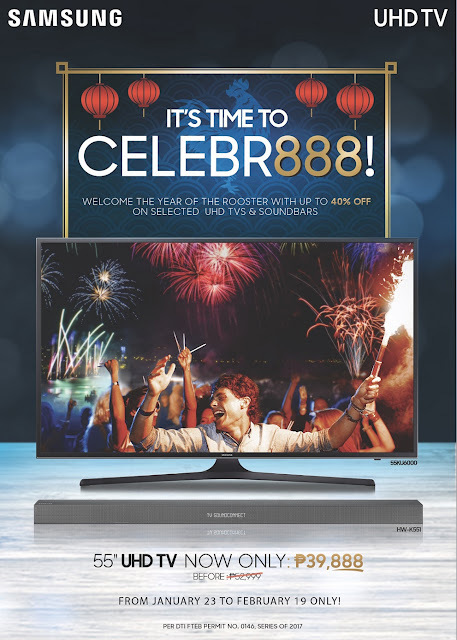 With few days left before the end of Samsung’s “It’s Time to Celebr888” promo, be one of the many who have start 2017 with next-level home entertainment. Save as much as Php 21,000 when you buy a Samsung UHD TV up until February 19 from Samsung authorized dealers nationwide. What’s more, Samsung treats you in completing the viewing experience upgrade through extending discounts on Samsung Soundbars (Flat Soundbar HW-K360, Flat Soundbar HW-K450, and Flat Soundbar HW-K550) when you purchase any of the participating Samsung UHD TVs. Celebr888 the new beginning and make the rest of the year more fun with these amazing deals. Head to the nearest Samsung authorized dealer, visit the Samsung Facebook page, or log on to samsung.com/ph/ offers for more details.